I’ve thought about living in an RV. It seems like such a good way of wintering wherever your whims take you. West coast, east coast, dessert, beach–Why choose just one, when you can simply wake up and move on to greener pastures? RVs remind me of turtles. As night falls you just tuck into your home and fall asleep. 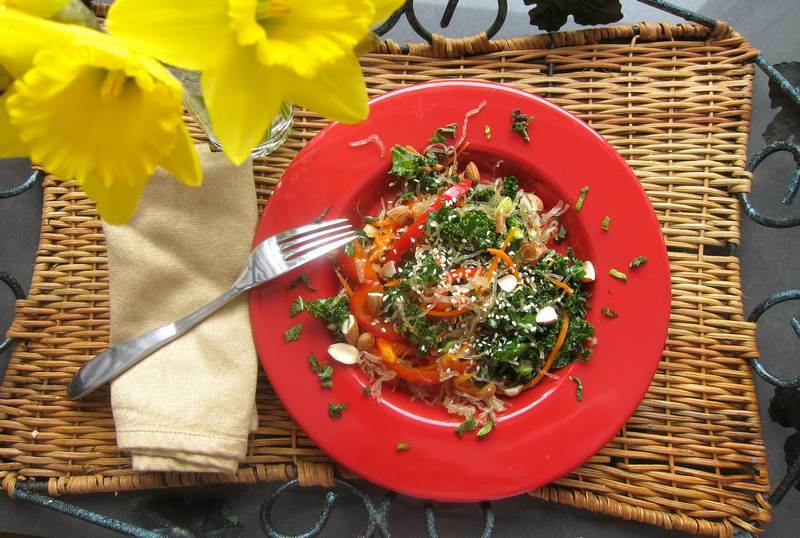 The creative former RV inhabiter Hannah aka Gypsy Roller, inspired this Crunchy Veggie-Noodle Salad. Her Pink Vermicelli Rice Noodle Salad grabbed my attention and brought out the creative almost-RV inhabiter in jittery me. In a medium-sized salad bowl, mix dressing ingredients. Add kale, and toss to coat. 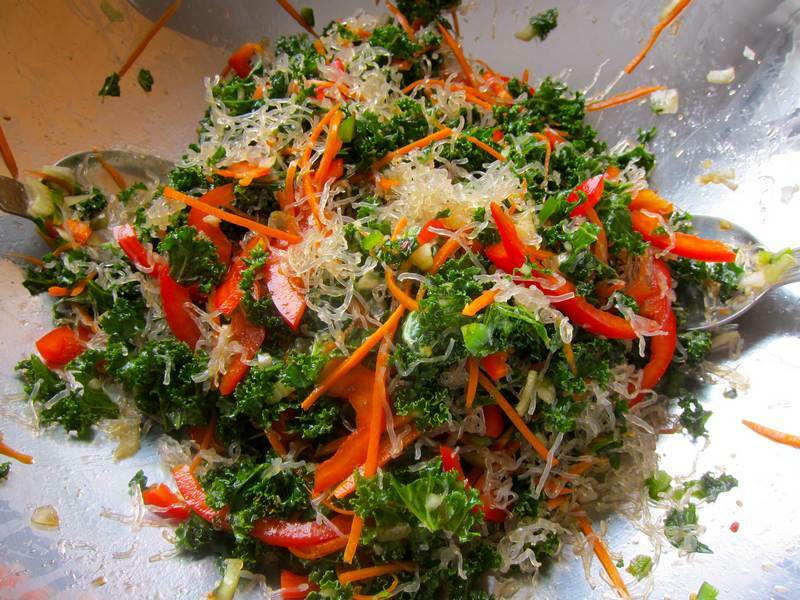 Allow kale to marinate while preparing the rest of the vegetables. Add the remainer of the salad ingredients, and toss. Garnish just before serving. Serves only 4, ’cause it’s hard to stop eating. Tastes great even after a day or two in the fridge. 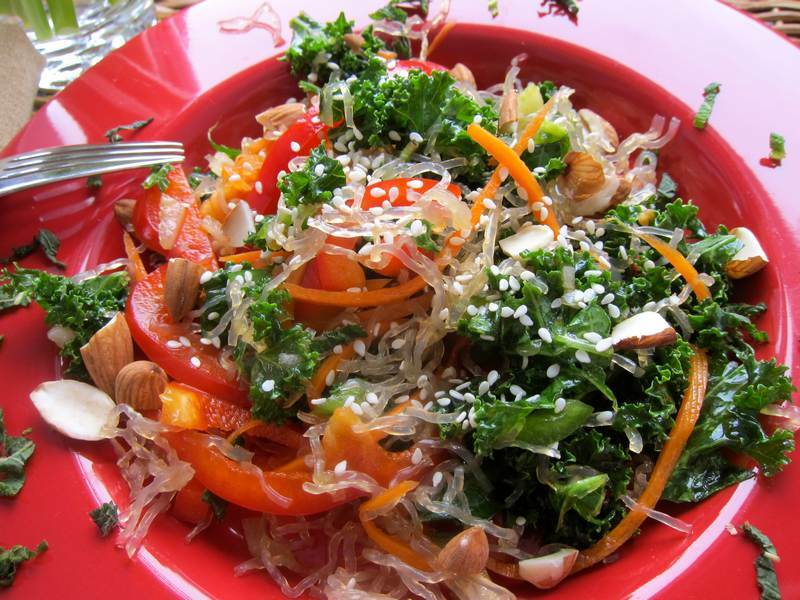 Have you ever tried kelp noodles? Now that I’ve put them in soup and salad, I’ve got to try them with a pasta sauce. I’m in full kelp noodle love mode. You can find them in Asian markets or health food stores. 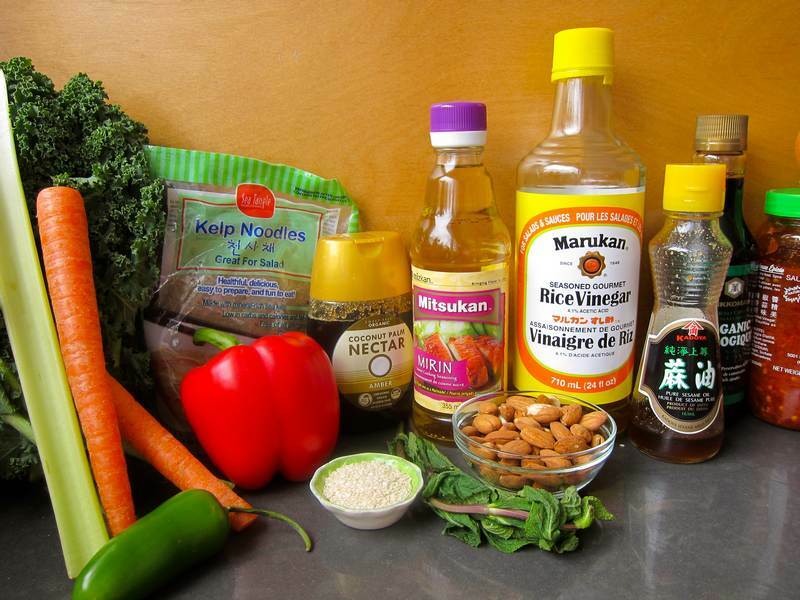 My super-taster son Andrew approved the Crunchy Veggie-Noodle Salad taste and texture. 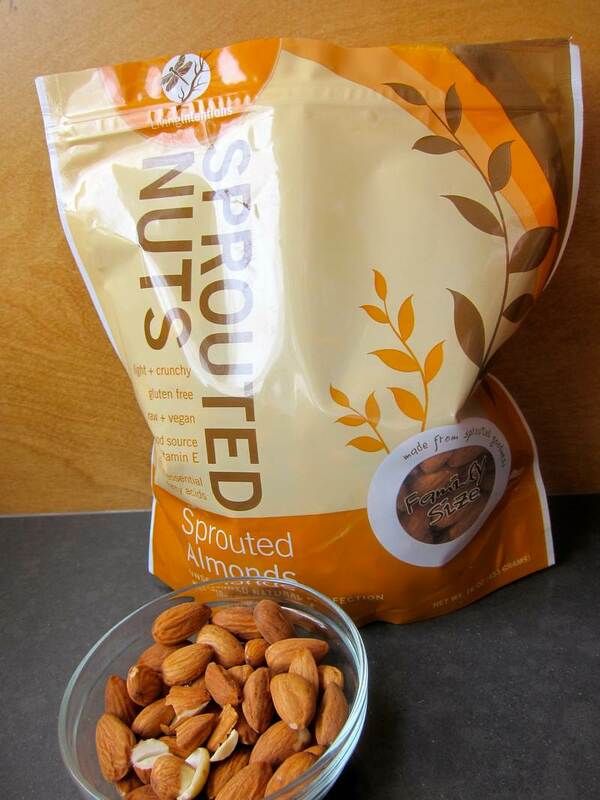 Blame the sprouted almond addition on my superfood-crazy brother. I’ve never tasted almonds quite like the ones pictured above. Perhaps they are just now entering the market. Anybody know where to find them? Anybody out there making your own? They are soaked, then dried to crispy crunchy concentrated almond-flavoured goodness. Are you eager to meet Oprah? Here’s your chance. How about a spring Pampered Chef – Jittery Cook get together? Date to be determined. Email me at [email protected] if you are interested in attending, if you already know what Pampered Chef products you’d like to order, or if you want more information. Thanks Janet. Got any great kelp noodle recipes? Thanks! I’ll check these out. I find that just a quick rinse makes them good to go for a recipe with crunch. In this veggie salad they taste good even after 2 days in the fridge. That’s impressive. You should put out a book of all your first paragraphs! I love that idea George. Jittery Thoughts! Thanks Holly. I entered the Oprah contest with the following: My favorite thing is my friends’ blogs. With the internet and easy blog making sites, everyone can be a writer. I have one friend who writes about unusual and healthy recipes (The Jittery Cook) and another who writes about her life after 50 with photos of her in town adventures, and another who writes about just about anything – including politics, humor, travel and sharing other life experiences and intellectual thoughts. As the Gazette says “Words Matter”. Carolyn! That’s the nicest comment ever! Now Oprah has two Jittery Cook favourites. Hope one of us wins! Thanks for the kind words about my blog – perhaps a jaunt in an RV is in your future? Hey Hannah! Maybe it was the kelp noodles in the squash soup I wrote about last week? We seem to share our love for homes on wheels and food stuffs. Glad you like my take on yours!